A cycle street and a cycle bridge were festively opened in Utrecht last Friday. 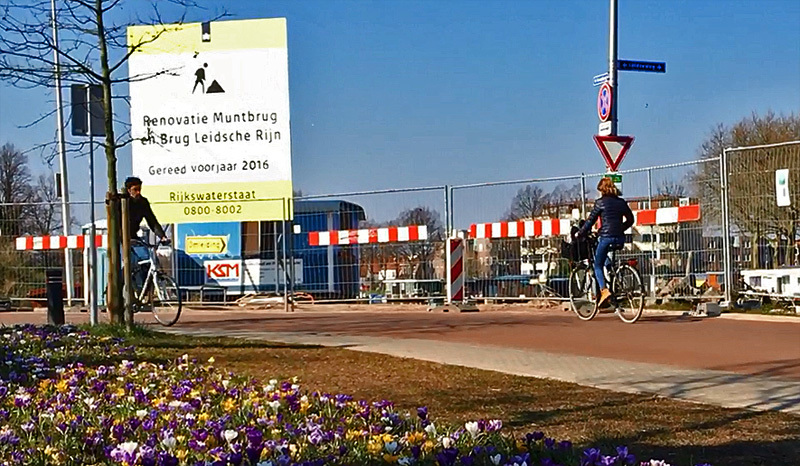 They are two important parts of an improved and partly new main cycle route to “Leidsche Rijn”; the residential development in the west of Utrecht that will house around 100,000 people eventually. 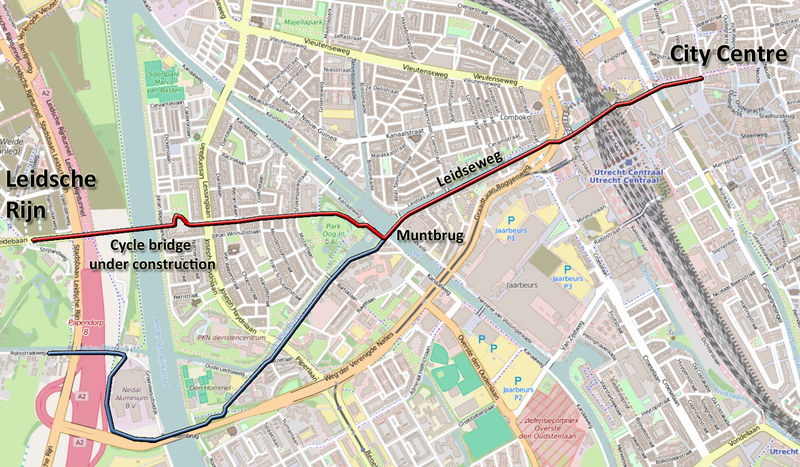 Leidsche Rijn will have increased the Utrecht population by about one third, once it is finished. To give all these people a fast and convenient cycle route to the city centre, Utrecht is upgrading existing routes and building new parts of what will be a great cycle route very soon. The new cycle street in Leidseweg. One of the residents was so kind to show that an open car door poses no problem: there is more than enough space to safely pass an open door. The sign mentioned the opening would be in Spring 2016. There was a delay because the state of the bridge was far worse than expected. Still from my “Spring 2016” video. Early in the 20th century the road couldn’t handle all the traffic to the west and already in 1953 an alternative bigger road was opened just south of the original route. One year earlier, the new Amsterdam-Rhine canal had been opened. This meant that from then on both the road and the canal were no longer used for the main flow of traffic. Road traffic used the Graadt van Roggenweg and the Weg der Verenigde Naties to go to the west, commercial ships used the new Amsterdam-Rhine canal. Both the old road and the old canal remained as they were, almost frozen in time. For the swing bridge the lack of maintenance meant it fell into a state of disrepair and before long it lost its capability to be opened. The old road was now only used by residents and increasingly for cycling. Effectively this was an unbundling of routes for different modes before we even had a word for it! Festive and very colourful figures walked around to celebrate the opening. 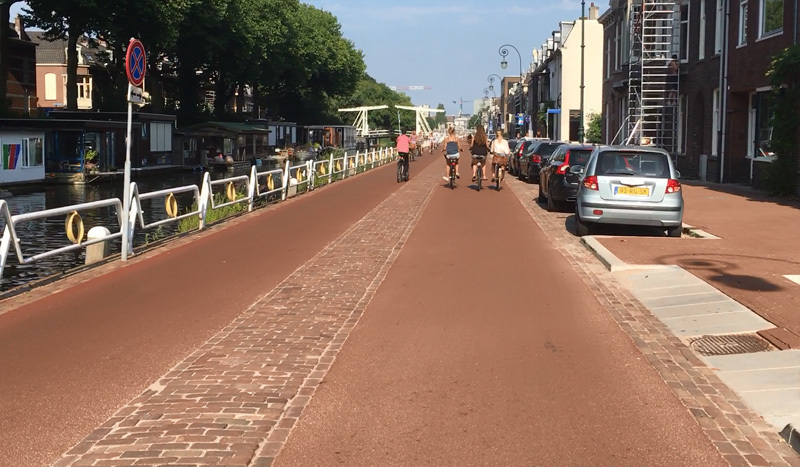 When Utrecht wanted to build a high quality fast cycle route to the new urban development in the west, the old direct route was the most logical choice. Since traffic was already diverted to a different route, it only needed a surface quality improvement. It also needed a new bridge over the Amsterdam-Rhine canal to shorten the route. That cycle bridge is now under construction and it is expected to be opened before the end of 2016. It took a bit longer before it could be built, because a school was in the way. That school was removed and a new school building has now been built, with the access ramp for the cycle bridge on its roof! When the bridge is finished I will of course write about it, but you can already get an idea on this Canadian blog. Leidseweg in 2010. The layout of the street had almost not changed since at least the 1950s. Although that speed hump was a far later addition. The same location in 2016 with the smooth red asphalt for more comfortable cycling. There is a mountable median that suggests 2-way motor traffic, but that is not the case. Cars are only allowed in one direction, cycling is allowed in both directions. The residents of the Leidseweg were not at all in favour of using their street as a main cycle route. They had grown very attached to the pre-1950s lay-out of the road with its brown brick surface. Red asphalt would damage the historic look of the street, they felt. The same residents had a blind spot for their – not so historic – cars, which they do want to keep parking in their street. 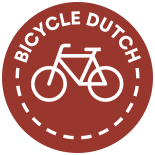 The Utrecht council therefore rightly ruled in favour of the comfort for cycling. A main cycle route cannot have a surface of wobbly bricks. The street now has a surface of smooth asphalt. The tone of the red is kept down, so it is more a reddish-brown. In my opinion it stays very close to the original brown brick and I expect most people will get used to it very quickly. 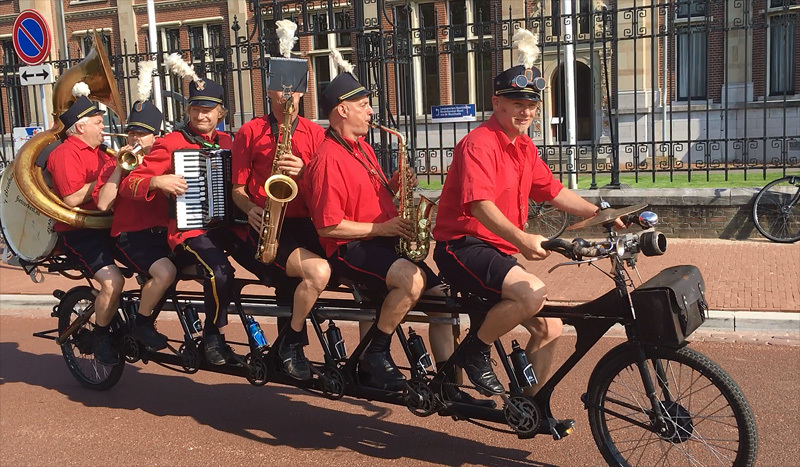 A band on a bike! The Fietsorkest from Brabant gave the afternoon a very festive atmosphere! In the background the building of the Royal Dutch Mint. The Muntbrug is still owned and maintained by Rijkswaterstaat. This agency decided to restore the bridge that has now been declared a national heritage site. The swing bridge dates from 1887 and was originally hand operated. To be able to do the restoration really well, the bridge was completely removed in September 2015, and shipped to a factory in Moerdijk. That is an almost 70 kilometres journey to the south-west of Utrecht. After it was stripped of all the paint that accumulated in almost 130 years, the steel bridge with its riveted joints turned out to be in a far worse state than expected. The restoration took a lot longer for that reason. The bridge was partly reconstructed using old techniques. It got 4,000 new rivets and it can still be operated manually, but it also has an electric motor to swing the bridge now. For almost a year a temporary bridge replaced the original bridge, so there was no big detour for people walking and cycling. In July 2016 the restored bridge arrived back in Utrecht. In the meantime the brick bridge abutments had been replaced (recreated after the original examples, in new brickwork). After it was fully reconnected, the restored bridge could be used again from early August. The Utrecht alderman for traffic, Lot van Hooijdonk, almost seems to hold her speech at a beach. 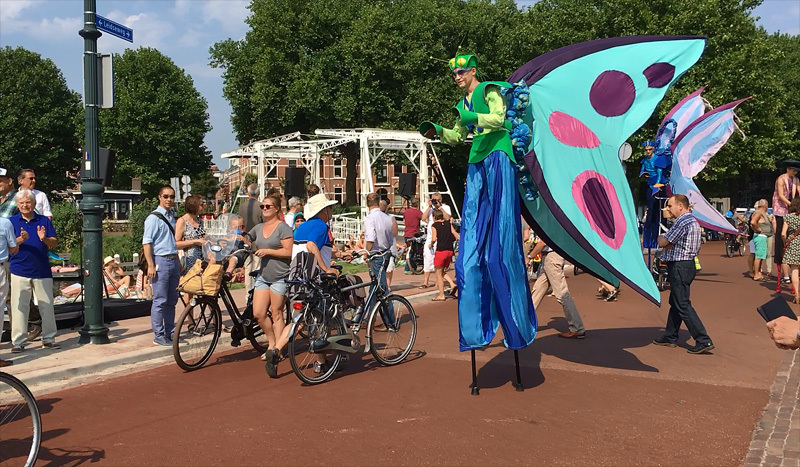 Utrecht and Rijkswaterstaat together hosted the official and festive opening last Friday 26th of August. With temperatures close to 30 degrees Celsius and bright sunshine, it was a beautiful day. The shores of the old canal are loved by sunbathers and on such a lovely day it looks a lot like a beach. 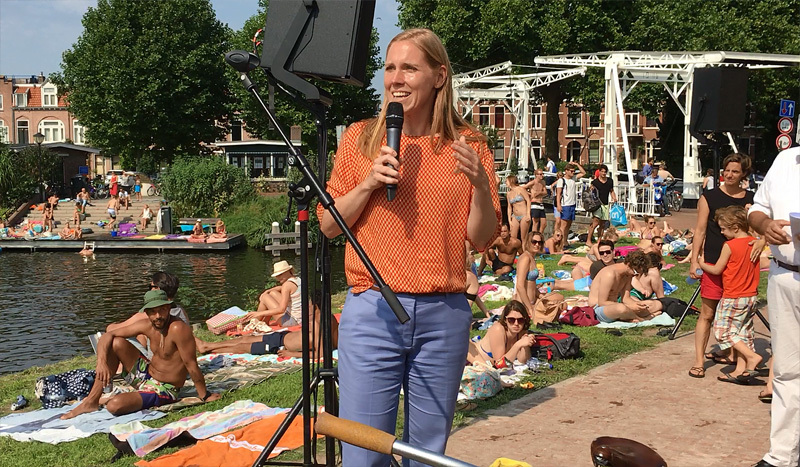 The people in their bathing suits were very surprised when the Utrecht alderman for traffic, Lot van Hooijdonk, suddenly showed up on her bike with a band, also on a bike. They were even more confused when she and a representative of Rijkswaterstaat suddenly took a microphone to speech about the return of the Muntbrug and the opening of the cycle route to Leidsche Rijn. The bridge had been swung open and a ship from the city of Utrecht passed, blowing its horn loudly, followed by rowers in a coxed eight rowing boat. Confusingly the bridge was then closed (which took a little under three minutes!) to officially open it. The crowds taking hold of the bridge then marked the beginning of a new era. For now and in the coming months, the route to the new urban development takes a long detour to the south, but once the cycle bridge over the Amsterdam-Rhine canal will also be opened at the end of this year, Utrecht will have another great cycle route added to its already great cycling network. Celebrations for the opening of the new cycle route and the restored bridge. A ride from the Muntbrug to the city centre on the fietsstraat of Leidseweg. Note the spelling difference in “Leidse Rijn” (the canal) and “Leidsche Rijn” (the new district of Utrecht), the latter is actually the old spelling (pre 1930s) which is really odd for the new neighbourhood, but that is what commercial developers come up with, trying to make names more fancy. The streetname also followed the official Dutch spelling simplification and became Leidseweg (pre 1930s it was Leidscheweg). There is no difference in pronounciation, the “ch” was already silent. Another very enjoyable and interesting post. So nice to relax and cycle along the canal “with” you. I can’t wait for the day when Virtual Reality is part of your and other NL cycling blogs to make this vicarious experience even better. Why Muntbrug is translated as Mint bridge instead of Coin bridge? In Dutch we use the same word for coin and mint (munt), but in English the first is the actual money and the second is where they make those coins. The bridge refers to the coin making institute, not to the coins. That is why Muntbrug translates to Mint bridge and not Coin bridge. 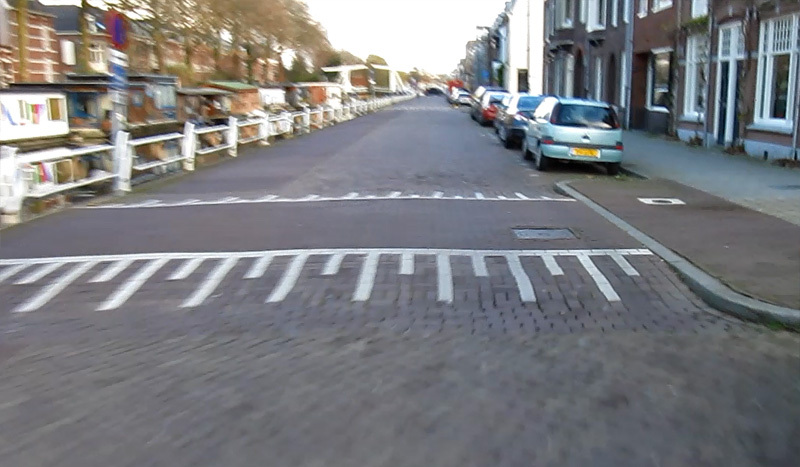 Mark, what are the rules on this fietsstraat? Speed limit for motor vehicles? Can motor vehicles pass bicycle riders (seems that passing was at one time not allowed on a fietsstraat but sometimes now is)? The problem is that Dutch law has nothing on the Fietsstraat, so there are no real rules. That means the speed is that of the area and that is 30km/h. Even without rules it has become custom though, not to pass people in a cycle street with a car, but that is not a law, it’s just considered prefered behaviour. Thank you for capturing this change Mark! It is almost exactly one year since I stayed on this route (http://ibikelondon.blogspot.com.au/2015/07/now-that-tour-de-france-has-left-what.html?m=1) and used it every day and I am so impressed at the speed at which it has been overhauled and to such a high quality. I remember the posters in the resident’s windows, fearful of the change to come, and as a scheme which could be replicated overseas I’d be interested to know how the city overcame this resistence. Utrecht is always refreshing itself! How the city overcame the resistance? They just ruled against a NIMBY minority in favour of the majority (of cyclists) that would otherwise suffer too much. The interests of the larger group outweighed the oposition of the smaler group by far. I laughed when you filmed the swimmers and then slowly panned down to the “no swimming sign” 🙂 Thanks so much for these posts… I always look forward to a new blog entry here! Fell in love with the NL when I visited in no small part due to the bikes and city design, and moved here. This blog was instrumental in cinching the decision for me. perpetually jealous! :`I thanks for documenting, mark! I was exactly here 26 days ago on the 4th of August. 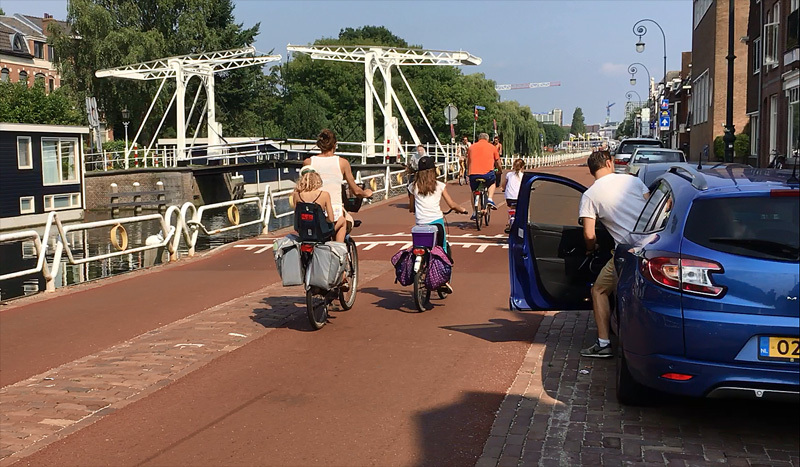 It was an interesting feeling to use a fietsstraat for the first time, but I will say that it was much better than even the low volume streets in my city. It just feels so gezelig for lack of a better word in English, and so fast, I would have gone faster but my dad is slow on a bike! This entry was posted on 30 August 2016 by Bicycle Dutch in Original posts and tagged bridge, cycle streets (Fietsstraat), main cycle routes, unbundling, Utrecht.